As technology adds new features to our everyday lives... opportunities for electronic thieves will continue to emerge. With embedded RFID chip technology being used everywhere, there is a potential for electronic theft of credit card information without your knowledge. Below is a TV news video clip from station WREG in Memphis, TN highlighting a new way that your credit card information can be stolen. Click here for additional information on the WREG website regarding this new high technology threat. 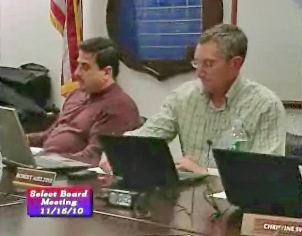 At their last meeting on November 15 chairman Rob Aseltine declared that the Longmeadow Select Board was going to conduct their meetings using new netbook computers which would reduce the large volume of paper that is generated every week. In addition, he stated that town residents will be able to access SB meeting information via the Internet. An announcement was made that a "new website" had been created by the Select Board to share these documents with town residents. Here is a link to this new resource. I've checked this link for the past 3 weeks after the initial announcement was made but no documents as yet have been available to the public. I usually watch the bi-weekly SB meetings but being without a copy of the relevant information that is being discussed sometimes makes it very difficult. I expect that having the pertinent information available will be particularly useful for upcoming budget discussions. I applaud this effort to share information in a timely manner with the public. However, there still appears to be "some minor glitches" remaining. Perhaps after the IT consolidation is completed and additional school dept. resources can be utilized, these problems will be worked out faster. Going paperless and sharing SB meeting materials with town residents via the Internet is a great idea! I would hope that meeting materials for tomorrow night's SB meeting will be made available before the meeting commences.